Guests get comfortable with free Wi-Fi fully equipped in-room kitchens and complimentary breakfast at the non-smoking Home2 Suites by Hilton - Memphis/Southaven. Colorful modern touches welcome guests in the lobby of Home2 Suites a non-smoking property. Its 105 rooms are equipped with full kitchens free Wi-Fi iPod docks and 42-inch flat-panel TVs. Guests fill up at each morning's complimentary breakfast buffet before getting to work in the business center or fitness room. The on-site laundry facilities convenience store and grocery shopping service make life a little easier. The indoor pool and hot tub are added pluses. Pets are permitted at no extra charge. Parking is free. 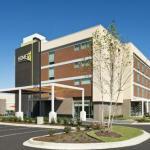 Off I-55 Home2 Suites is 20 minutes south of Memphis in Southaven Mississippi. The hotel is in the midst of an outdoor shopping mall so eateries and shops are steps away. It's five minutes from shows at the outdoor Snowden Grove Amphitheater and games at Snowden Park. Families head 25 minutes north to the Memphis Zoo and the Children's Museum of Memphis. Sun Studio Graceland and the Stax Museum of American Soul Music are all within 20 minutes as is the National Civil Rights Museum - Lorraine Motel. Memphis International Airport is eight miles away and the Amtrak station is 16 miles.